Like hundreds of millions of others, I've been following with rapt attention the confirmation process for justice Brett Kavanaugh. After a highly emotional senate hearing that included the grilling of accuser Dr. Ford, the vote to confirm happened yesterday. Kavanaugh was sworn in as a supreme court justice in a private ceremony quickly after. This is a classic example of a He said, She said debate that has divided a nation already cleaved in two from almost two years of Trump rule in America. Here is the most disturbing thing about this highly charged confirmation. On the one side you had Him: an Ivy league educated and highly touted and respected judge who denied all accusations of sexual misconduct. On the other you had Her: a highly intelligent, credible and respected doctor. Put in a situation of having to place a vote next to one or the other, in terms of believability, a slim majority chose Him. Dr. Ford was the best possible witness. She was articulate, composed, respected by all sides, and driven by a deep seeded sense of civic duty. Under oath she had absolutely no doubt that the person who assaulted her all those years ago was being considered for the most powerful judicial position in the United States. While it would have saved her unimaginable pain and and loss of privacy, she chose to speak up because she thought it was the right thing to do. It's not that she was ignored, but in the end, a majority of the senate voted that what He said trumped what She said. What does this say to the countless victims of sexual violence who are not highly educated, articulate and respected with a "Dr." in front of their names? 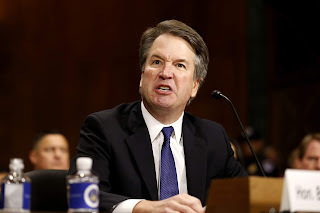 In an era when powerful men in a broad spectrum of positions are falling from great heights after almost no due process, here you have a situation where due process was followed with the full force of the FBI and the scrutiny of the entire United States Senate, and the male accused gets elevated to a position of ultimate authority - His word ruled over Hers. I can't begin to suggest that I know the full truth of what really happened all those years ago and whether or not Dr. Ford's memory is more accurate than that of Judge Kavanaugh's. All I can say is that as an outside observer, I cannot imagine a stronger victim statement and testimony than what we heard from Dr. Ford. Yet, it wasn't enough. My thoughts are with the countless women who might feel disheartened and discouraged about seeking justice because of what has just happened.